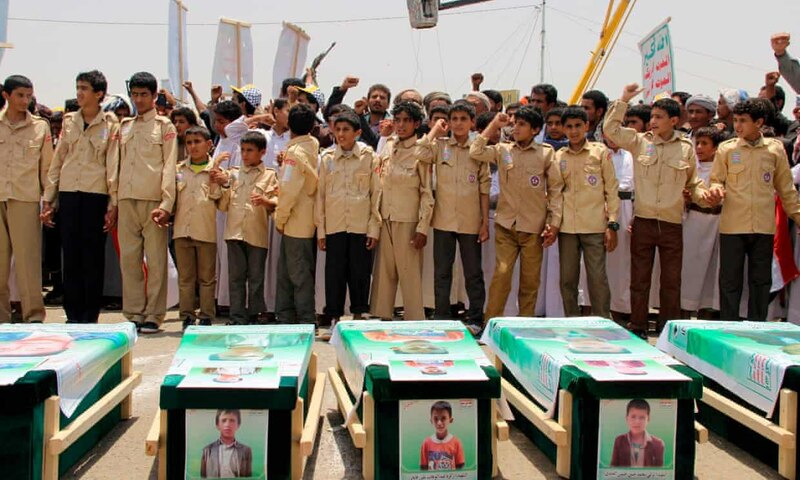 Two years ago this month Saudi warplanes, “armed, fueled and maintained by British and American-loaned personnel”  bombed a funeral hall where most of the Yemeni élite were known to have gathered for the funeral of a former minister. Four waves of airstrikes followed. Then, after ten minutes as rescuers moved in, the Saudis, copying the US tactic of the “double tap” struck again. Over 150 died. Unlike the Khashoggi affair, both events have been reported but with little further comment. In the interim period the UN says there have been close to 18,000 casualties about 11,000 of them due entirely to the Saudi bombing using the materials and personnel (mainly) supplied by the UK and US. Saudi Arabia is by far the biggest customer for their weaponry. It is true that Obama (who had supplied $115 billion worth of weapons to Saudi) called a halt to the export of precision guided systems since the Saudi were abusing them to attack schools (over 1100) and hospitals but this ban was overturned by the Trump administration. Trump today not only has $110 billion reasons for continuing to help Saudi Arabia wriggle out of the consequences of its murder of Jamal Khashoggi inside its Turkish consulate. Saudi Arabia is also one of the two lynchpins in the anti-Iranian strategy of the US. It is for this reason that the US will continue to back them. It is a long term alliance which goes back to the end of the Second World War  and has not been without its strains in the past. Saudi has in fact been a “rogue state” ever since the decline of the USSR when it began supplying Salafist fighters (the so-called Mujihadeen) with weapons in Afghanistan, then Chechnya, Bosnia and in the Middle East including for a time even the Islamic State. However as the US saw it Saudi Arabia’s oil enabled it to buy those weapons from the largest arms supplier on the planet and the petrodollars were thus recycled back to the US. It enabled a certain turning of a blind eye  to Saudi’s increasing agenda of its own which saw it become a rival of Turkey after the Arab Spring. Why did Jamal Khashoggi die? This morning, Turkish forensics combed a forest on the outskirts of Istanbul looking for the remains of Jamal Khashoggi. Only three weeks ago no Western journalist who was not part of the exclusive world of Washington power could recognize his name. Jamal Khashoggi was one of those characters riding diplomacy, business interests, intelligence and the Saudi media apparatus. Collaborating as an occasional columnist in the Washington Post gave him an excuse to access corridors, offices and events as a "journalist". There was a basis for this, in Arabia he had been general manager and editor-in-chief of Al-Arab, a 24hr news channel and editor of Al Watan. As in all the great families of the region, beginning with the Saud that give name to the country, business, politics, religion and the media, they were woven into a single skein of interests that linked national capital and family/clan interests. This was nothing unusual under the Arabian Peninsula’s particular form of state capitalism. Jamal was a grandson of none other than Muhammad Khashoggi, the personal doctor of King Abdulaziz Ibn Saud, the first head of state in Saudi Arabia. The Khashoggis came from Cappadocia, Turkey, and were part of the local elite drawn by the sultanate to all corners of the Ottoman Empire. Recognized Turkophiles, their businesses always played on the network between the old Turkish provinces – from Sudan to Central Asia – Washington and London. Remember too that his uncle Adnan Khashoggi, once known as the largest arms dealer in the world, created a global network that involved much of the Western political class and the secret services of half the planet. His cousin was Dodi Al Fayed with long-held interests in Alexandria, whose investments in London led to a certain fame and, according to what the intelligence gossip said at the time, to an eventful end with Diana, Princess of Wales. In short, Jamal Khashoggi was far from being "a journalist" as has been discreetly claimed by the media. Jamal Khashoggi was one of the heads of a powerful clan that was born in the very origins of the Saudi state and built on its historical bond with Turkey and non-Wahhabi political Islam. The rise of Erdogan and his reinvention of the "political Islam" that includes an alliance with the "Muslim brothers" aroused a great deal of sympathy in a family that had been doing business with them for decades and this was reflected in their media bastion. No surprise then that the ascension to the throne of Prince Salman in a growing war against Iran, led Jamal to an increasingly lively confrontation with the Crown Prince. The accusations against the young heir of "losing the North" and abandoning "political Islam" by allying with Egypt, the Emirates and Israel instead of Turkey and Qatar in the new regional imperialist map, led Jamal to abandon Saudi Arabia the end of 2017 and take refuge in ... Turkey. Turkey, after suffering the real economic warfare of the US, decided to give in to Trump's original demand and free a prosecuted Protestant pastor. It was in a moment of weakness, hemmed in Idlib by Russia, humiliated by Trump and the economy shattered. And in the middle of all this, on October 2, Jamal Khashoggi entered the Saudi consulate in Istanbul to arrange the papers for his new marriage. He would be cut into pieces. Turkey denounced his disappearance from the very first. It led the expressions of "global indignation" and “managed” the information it had, from the video cameras of his entrance to the audio recordings of the torture and now finally, its forensic analysis. Meanwhile, the relationship between Trump and the Saudis was deteriorating. The US needed an increase in oil production from Saudi Arabia so that its strategy of strangulation of Iran would work. But Salman needed money to finance his very rapid imperialist expansion which, according to the IMF, was unsustainable with low prices. Trump, emboldened by Turkish humiliation, exploded before the Arab prince, declaring that the Saud would not last on the throne "two weeks" without their support. Erdogan had a sore on which to press. The management with account drops of information about the fate of Khashoggi served him to dismantle one by one the media responses filtered by the Saud. Salman's response to the threat of American sanctions if the murder was proven was to threaten reprisals. For the first time, the relationship between the US and the Saudis threatened to break up. The stock exchange of Riyadh lost in hours what it had gained in a year. Luckily Erdogan was there to "help", by going behind Prince Salman and talking directly to his father. The road was marked for Trump. Mike Pompeo traveled to Ankara to garner more Turkish information before his President had to contradict himself yet again. In return Erdogan, obtained the withdrawal of some American sanctions and funds "under investigation". "The Saudis are too important as business partners," Trump said. Now that Saudi Arabia’s Gulf neighbours can openly express their fear of Mohammed bin Salman, Erdogan can appear as his counterweight. Kuwait signed a treaty of military cooperation with Turkey and the media now wonders if Salman will now succeed to the throne while analysts around the world have declared the Crown Prince "unreliable". The revenge of the Turks and Qataris is complete. With Salman weakened, perhaps removed from the throne, they were able to use Trump’s malleable nature through their ability to create global news; not only through Aljazeera and Hurriyet but also by unleashing all the media in which they participate, directly or indirectly, in Europe, such as PRISA. This explains why few hear of the eight million people facing famine  in Yemen as a result of the Saudi-Emirati bombings and military blockade and thousands of families try to flee in small boats to Africa, yet a single dead individual, a supposed "journalist", shakes the world’s ruling classes. All of them are part of the war in Yemen, and the culprit is imperialism as a whole, everyone's, from Iran to the US. A murdered individual though has, in the end, only one culprit and this allows "global indignation" to be “managed”. And to the fact that 15 of the 19 9/11 bombers were Saudi citizens (the Bush Administration discreetly arranged for Osama bin Laden’s family to be flown out of the USA. The UK will not exactly “stand” with Saudi but they are desperate to sell weapons (a major export for this declining imperialist power) to anyone. It’s not so much as the old cliché has it that the “principle of trade demands the trading of principles” as that beggars cannot afford principles of any kind and all talk of principles in imperialist discourse is, of course, complete hypocrisy – something British imperialism has developed as an art form. On October 24 the UN announced that this figure is now 14 million.